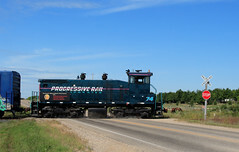 Progressive Rail SW1500 PGR 74 leads the Faribault job back to Northfield. Apparently some dust gets built up when there are only 0.29 trains per day clearing out the flangeway. This photo appears in the November, 2016 issue of Model Railroad Craftsman.